Patient safety is a key quality indicator for healthcare organizations. A medical-surgical geriatric unit developed a checklist to be used during interprofessional rounds and maintained by the nurse. 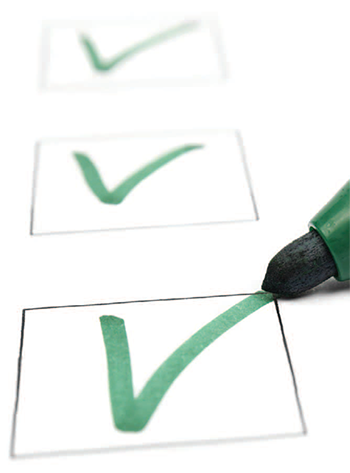 The checklist focuses on issues related to hospital-acquired infections, I.V. access, ejection fraction, falls, and oxygen. Patient safety and care quality are the primary objectives for hospitals, patients, and their families. Medi – care and Medicaid reimbursement practices and the influence of quality indicators have sharpened that focus even more. Hospital-acquired conditions—such as catheter-associated urinary tract infections (CAUTI), hospital-acquired pressure injuries (HAPI), central line–associated bloodstream infections (CLABSI), and falls with injuries—are quality indicators used to measure how well a hospital delivers care. After dealing with a series of CAUTIs on a 21-bed acutecare unit for geriatric patients, we developed a nurse-driven checklist to address quality, safety, and discharge planning. In 1999, the Institute of Medicine published To Err is Human: Building a Safer Health System, the first in a series of reports focusing attention on quality and safety in healthcare. Since then, hospitals have built adverse event reporting systems, increased technology use to enhance patient safety, and modified strategies to address the alignment of financial incentives with quality indicators. In addition, legislation has been passed that addresses quality in healthcare. For example, Congress passed The Patient Safety Quality and Improvement Act of 2005, which encourages patient safety through confidential reporting of adverse events. As this focus on patient safety and quality continues to rise, innovative solutions from the bedside are paramount to facilitating consistent care. When designing our checklist, we started with areas of safety and quality. After a series of CAUTIs and one CLABSI in the summer of 2017, priorities included catheter management, central line care, fall prevention, and pressure injury prevention. Next, we considered what word would be an easy reminder and point of reference during interprofessional rounds to lead nurses through the checklist. After brainstorming and writing down the first initial of all of the quality and safety concerns, we landed on CHIEF. Recent miscommunication around oxygen requirements for discharge prompted the addition of “O” by our team-based physician assistants. This led us to our final acronym, CHIEF O. We implemented the checklist in July 2017. CAUTI—Does the patient have a urinary catheter; what is the indication and is it still needed? HAPI—Does the patient have a pressure injury or is the patient at risk for pressure injury? If he or she has a pressure injury, has the wound care team seen the patient and made recommendations? I.V. 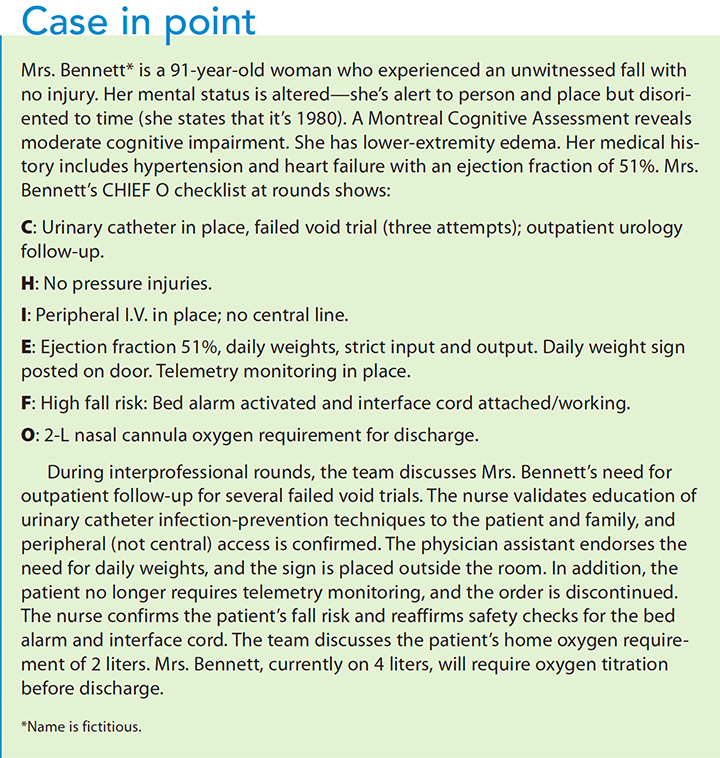 access—Does the patient have peripheral or central line access? If a central line is present, what is the indication and when is the dressing due to be changed? Ejection fraction—Does the patient have heart failure? Is there an order for daily weights and is the daily weights sign posted outside the door? During this section, we also discuss telemetry requirements. Falls—Is the patient at risk for falls, has the MORSE Fall Scale (ahrq.gov/professionals/systems/hospital/fallpxtoolkit/fallpxtk-tool3h.html) and the TIPS (Tailored Intervention to Promote Safety) sheet* been printed and posted in the room, and is the bed alarm/interface cord plugged into the wall and functioning? In the beginning, the nurse manager would prompt nurses through the verbal checklist; after a few weeks, the nurses could complete it without guidance. To track data from shift to shift, we added the acronym to the nursing handoff sheet. Generally, it takes between 1 to 5 minutes to complete the checklist, depending on patient acuity. It’s used during interprofessional rounds on all geriatric team–based patients, which is generally about half of our 21 patients. Interprofessional rounds occur Monday through Friday at 10:00 AM, excluding holidays and weekends. Our results showed an improvement in CAUTIs with no incidents for 10 consecutive months through May 2018. Similarly, a CLABSI in July 2017 was followed by a CLABSIfree 7-month period. (See Check list results.) Unfortunately, a patient developed a CLABSI toward the end of the first quarter in 2018. This was an off-service patient (not on the geriatric service) who wasn’t discussed during interprofessional rounds or as part of the checklist. This particular CLABSI highlights the need for interprofessional rounds with all patients. Interprofessional collaboration is a vital component in the delivery of high-quality care in our dynamic healthcare environment. Before developing the CHIEF O checklist, our interprofessional rounds lacked a consistent focus on quality and patient safety. With the checklist, nurses report feeling more empowered to question whether a urinary catheter is medically indicated. By encouraging nurses and providers to discuss the indications for urinary catheters and central lines, we’ve realized the positive impact of interprofessional care. After a recent spike in HAPIs in the first quarter of 2018, the CHIEF O checklist has helped shape discussions on wound care consults and recommendations, as well as the use of a prophylactic foam dressing. Although a recent systematic review of prophylactic pressure injury dressings concluded that few vigorous studies exist in this area, the studies we analyzed found these dressings can be useful in preventing pressure injuries and saving money. Using our CHIEF O checklist, we are steadfast in our resolve to address our recent increase in HAPIs. As medical science evolves to address the challenges of patient complexity, so must our focus on patient safety and care quality. 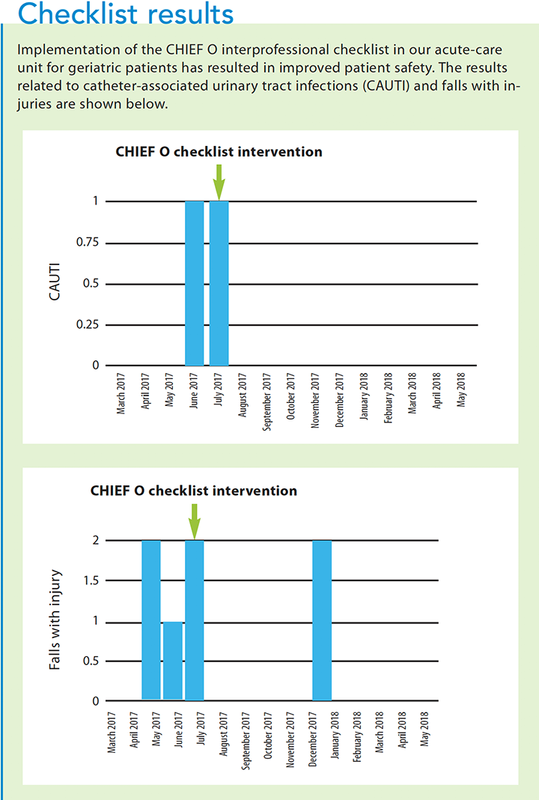 Implementing the CHIEF O checklist has increased our interprofessional care, appears to have decreased our infection rates with CAUTIs and CLABSIs, and has helped to empower our nurses to advocate for their patients’ safety. The authors work at New York-Presbyterian/Weill Cornell in New York. Paul Andrew Jones is a patient care director. Ashley Parliman, Meagan Groneman, and Jaclyn Schneider are staff nurses. *Each day, the nurse prints out the TIPS sheet, which is automatically populated with prevention images based on the results of the falls assessment. Options include: has a history of falls, needs assistance from one or two people, bed or chair alarm turned on, assistive devices needed, or has an I.V. pole. Anwer M, Manzoor S, Muneer N, Qureshi S. Compliance and effectiveness of WHO surgical safety check list: A JPMC audit. Pak J Med Sci. 2016;32(4):831-5. Clark M, Black J, Alves P, et al. Systematic review of the use of prophylactic dressings in the prevention of pressure ulcers. Int Wound J. 2014;11(5):460-71. Institute of Medicine, Committee on Quality of Health Care in America; Kohn LT, Corrigan JM, Donaldson MS. To Err is Human: Building a Safer Health System. Washington, DC: The National Academy Press; 2000. Keller C, Arsenault S, Lamothe M, et al. 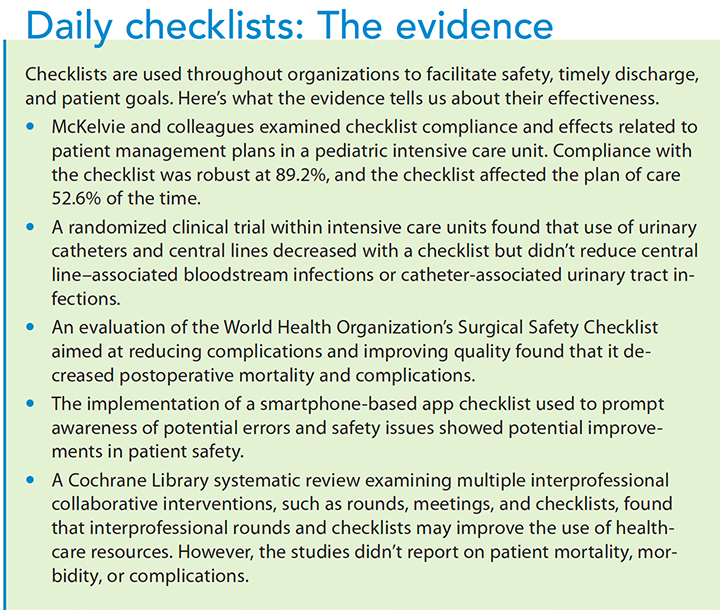 Patient safety ward round checklist via an electronic app: Implications for harm prevention. Ir J Med Sci. [published online ahead of print 2017]. McKelvie BL, McNally JD, Menon K, Marchand MG, Reddy DN, Creery WD. A PICU patient safety checklist: Rate of utilization and impact on patient care. Int J Qual Health Care. 2016;28(3):371-5. Reeves S, Pelone F, Harrison R, Goldman J, Zwarenstein M. Interprofessional collaboration to improve professional practice and healthcare outcomes. Cochrane Database Syst Rev. 2017;6:CD000072. Urisman T, Garcia A, Harris HW. Impact of surgical intensive care unit interdisciplinary rounds on interprofessional collaboration and quality of care: Mixed qualitative-quantitative study. Intensive Crit Care Nurs. 2018;44:18-23. Writing Group for the CHECKLIST-ICU Investigators and the Brazilian Research in Intensive Care Network (BRICNet); Cavalcanti AB, Bozza FA, Machado FR, et al. Effect of a quality improvement intervention with daily round checklists, goal setting, and clinician prompting on mortality of critically ill patients: A randomized clinical trial. JAMA. 2016;315(14):1480-90.